Hula Hooping is a nostalgic past time. Hula hooping is expressive and therapeutic. Hula hooping is a fun way to work out. Hula hooping can improve coordination and balance. Join in the fun at one of my classes! I’ve taught hundreds of individuals of all ages since 2010. My public classes are regularly updated in my “Upcoming Group Class” section. Don’t see what you want to learn there? Send me a message about scheduling a class! I’m available for group, private, semi-private and Skype lessons. What do you want to learn? There are currently no upcoming group classes. Want to stay updated on upcoming group classes without having to check this page again? Then sign up for my newsletter below! My mailing list is always the first to know. Now offering private instruction to advance and accelerate your hoop skills. Each class is tailored to your needs of instruction, time and location. $95/hr for 5 people or more. *NOTE: Above rates are for studio style classes. If you’d like instructional rates for an event you have coming up please send me a message. Save money by buying a private class package! That’s $10 off EACH private class! A $250 value!!!! Tips and tricks tailored just for YOU! One month unlimited hoop support! What does this mean?!? Are you ready to start hooping? 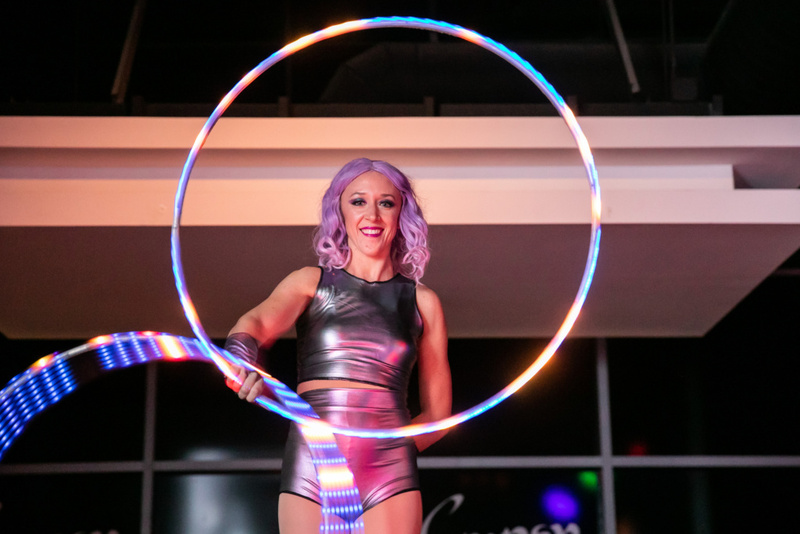 Click the button below to get moving and groovin’ with fun hoop classes!! Are you wanting to connect with your flow/circus/fire community? There are new meet ups and jams happening all the time. I’ve started a page dedicated to meet ups and public classes. To view all the resources follow this link. Jessica is proud to be among the elite group of artist sponsored by the internationally acclaimed LED prop company, Astral Hoops. She has using their products since 2012 for LED performances. For more information about Astral Hoops products click the links below! If you have any questions about Astral products, repairs, etc. Please contact me! Jessica’s Astral Hoops Sponsored Artist Page | Use THIS LINK to receive 5% off ALL Astral Hoops Purchases. “Hiring Jessica for a private session has been incredibly helpful to my choreography, confidence, and overall stage presence. Jessica provided a free consultation & a homework assignment to complete before our private coaching session. This homework helped brainstorm the agenda for our session to maximize our time and stay focused during our session on the specific tricks I requested help to improve. Jessica was fully prepared and incorporated poi to facilitate unlocking pathways in my body that transfer to the hoop. This was an excellent strategy that I would not have considered on my own. Before our session concluded Jessica allowed for a full video recap of the moves we worked on. Then, Jessica followed up with me after our private coaching session via e-mail with a full recap containing reminders, tips and encouragement! I felt that Jessica fully invested in me as a striving dancer and has absolutely set me on a pathway to gain confidence, expertise and skill with my hoop dance.